In the autumn of 2004, a few months after I had begun trying to picture once again my own family home as it stood empty on that morning eleven years earlier, I travelled to see a work of art which I suspected might have something to say about the relationship between houses and memory. The work, by the English artist Tacita Dean, is a film – or rather, three related and subtly different films – entitled Boots. On the day in question, I arrived at the Royal Institute of British Architects in London, where the film was to be installed for the next month, to discover that I had mistaken the date of the exhibition’s opening: it was not due to begin for another four days. The security guard who informed me of my mistake, however, was sympathetic, and I was directed upstairs to three adjacent rooms, where two technicians were busily preparing a trio of ancient and recalcitrant 16mm projectors. I explained my error, and they agreed that as soon as they had got the first version of the film running (focus was so far proving difficult), I could enter the first darkened room and watch a still slightly shaky back-up print of Dean’s film. Boots is a meditation on architecture and memory, shot in a vast Art Deco villa in Portugal that is now used as exhibition space by a nearby museum. The film takes its title from the nickname of an old family friend of the artist’s, so named for his orthopaedic boot, the sound of which, as it strikes the gleaming wooden floors of the villa, echoes through the twenty minutes of the first of the film’s three versions. The octogenarian Boots, his frail body supported by two walking sticks, wanders through the house alone, apparently recalling as he goes the building’s former, now deceased, inhabitant: a woman, Blanche, with whom, many years ago, he had an affair. In fact, the story he fashions out of the odd muttered reminiscence or sudden exclamation is at least partly fictional. Boots, unscripted, invents his own memories to fill rooms that are brilliantly sunlit and quite empty. He improvises his own character, while Dean’s camera gives the house itself a grandly melancholy personality, composed of cool shadows and sudden, blazing expanses of light. As the old man moves through the villa, the viewer realizes that the figure on screen is seeing a quite different film: a series of tableaux made, perhaps, out of his own past, now projected on to the pristine surfaces of an empty house. I watched Dean’s film with a growing sense that I was seeing something very familiar: the moment when one moves through a space both intimately known and at the same time utterly alien. The artist’s frail collaborator conjures the most moving images out of the tiniest details of the house: details which, for all the historical resonance of the house itself, and the ravishing cinematography which revives it, were invisible to the viewer. Boots, it seems, is seeing ghosts. ‘One has the feeling, or I have the feeling,’ he sighs at one point, ‘that they are still here, but in another dimension ... and that this whole house is in another dimension ... it’s not ... of the moment, if you know what I’m trying to say.’ Not only is the house, as Boots negotiates its remarkable rooms, overpopulated by mid-century ghosts, but the space itself seems to have dropped out of history, drifted off (like the massive ocean liner it resembles) into unchartable seas of memory. As this huge, convoluted theatre of memory opened itself up before me on the screen, I was reminded of another, more tangible artistic reflection on the house as an image of recollection and nostalgia. In 1993, the sculptor Rachel Whiteread made a work simply entitled House. The sculpture (if that is what it was: various civic dignitaries rushed to condemn it as an inartistic monstrosity) was a cast of the interior of a Victorian house, ‘exhibited’ in situ at 135 Grove Road, Bow, East London. Whiteread had garnered a certain amount of celebrity from her previous works, in which the interior volume of a single room was cast in blocks, later reassembled in the gallery to form an eerie white ghost of the original space. House was a good deal more ambitious and resonant: an entire phantom building was revealed once the outer shell (which was, after all, the house itself) had been removed and the specially formulated concrete beneath revealed. The sculpture unearthed an impossible volume: the solid replica of an empty interior, the image of a void once enclosed and supported by real bricks, real plaster. I have never seen Whiteread’s House: after months of controversy, it was finally demolished, and even the fact that the artist had won that year’s Turner Prize could not save it (might, indeed, have hastened its end). But photographs of it suggest that for a time it must have soaked up the memory of its environs: the surrounding streets which, pocked with derelict houses, had eventually been demolished. Stranded at the edge of the empty park that had replaced them, the sculpture gave the impression of having solidified memory itself. This was an illusion: it was not a solid mass at all, but a collection of vacant concrete boxes, held together by an invisible interior armature. You could have broken through its surface – some local squatters attempted to do just this – but you would not have found a habitable space, just a mass of wooden and metal supports. To the viewer on the outside, however, House made manifest a feeling that only occasionally overtakes one at home: that the substance of the house – the layers of brick, plaster, paint and wallpaper – is quite unreal, that the true house is the space in which we move. It is the empty volume that we get used to, that makes our bodies move in particular ways, that forms habits and physical attitudes which persist, awkwardly, after we have left. We often think of nostalgia – which is nothing more or less, etymologically, than the desire for home – as accruing to objects and images (and so it does, as we shall see later). But there is another sort of ache for the past, which has nothing to do with the visible and tangible world and everything to do with the void that abuts it in the most complex ways. If the photographic evidence is to be believed, visitors to Whiteread’s House must have been startled not only by the obtuse volume of the thing, but also by the way that emptiness was so minutely etched and convoluted. A house is not made of flat surfaces, but of odd protrusions, embossed or striated planes. Each tiny recession of the solid world around us is an extension of our own space, and therefore full of memory: a refined and slow-drying medium which covers everything. Nostalgia is no longer the word to describe the moment when we see the space around us for the complicated void it really is. At that instant – the instant, for me, of seeing the house empty for the first and last time – it becomes properly uncanny (which is to say: unhomely). The house no longer looks like itself, and yet it is reduced to its essence for the first time: recognizably a house from which we have been banished. The brilliance of House lay in the way it depended for its existence on a specific, unrepresentable space, and at the same time recalled all those who saw it (perhaps especially those who rejected it as art) to the vanished chambers of their own pasts. No house could be more comprehensively stocked with the detritus of the past than the empty house. Boldly combining the highly personal with the brilliantly scholarly, In the Dark Room explores the question of how memory works emotionally and culturally. It is narrated through the prism of the author's experience of losing both his parents, his mother when he was sixteen, his father when he was on the cusp of adulthood and of trying, after a breakdown some years later, to piece things together. 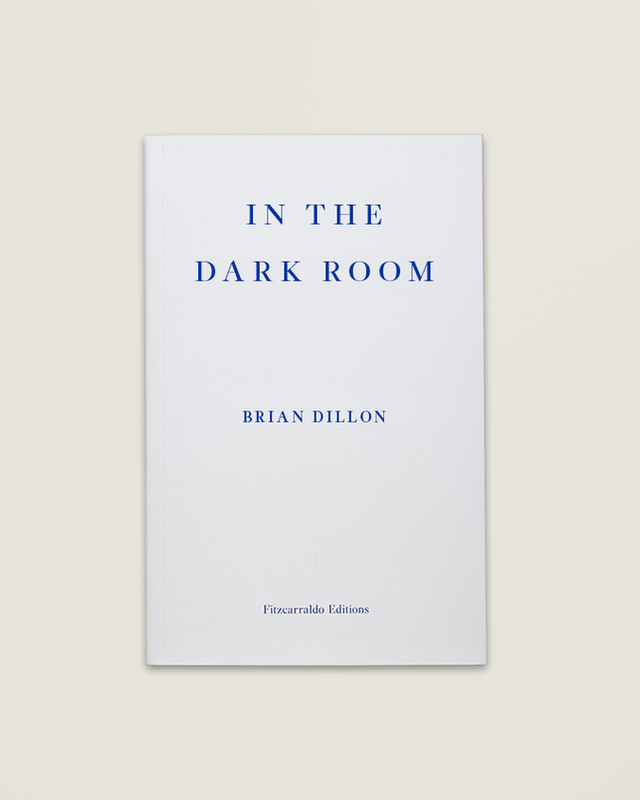 Drawing on the lessons of centuries of literature, philosophy and visual art, Dillon interprets the relics of his parents and of his childhood in a singularly original and arresting piece of writing reissued for the first time since its original publication in 2005, and including a new foreword from prize-winning biographer Frances Wilson. Brian Dillon was born in Dublin in 1969. His books include Essayism, The Great Explosion (shortlisted for the Ondaatje Prize), Objects in This Mirror: Essays, I Am Sitting in a Room, Sanctuary, Tormented Hope: Nine Hypochondriac Lives (shortlisted for the Wellcome Book Prize) and In the Dark Room, which won the Irish Book Award for non-fiction. His writing has appeared in the Guardian, New York Times, London Review of Books, Times Literary Supplement, Bookforum, frieze and Artforum. He is UK editor of Cabinet magazine, and teaches at the Royal College of Art, London.